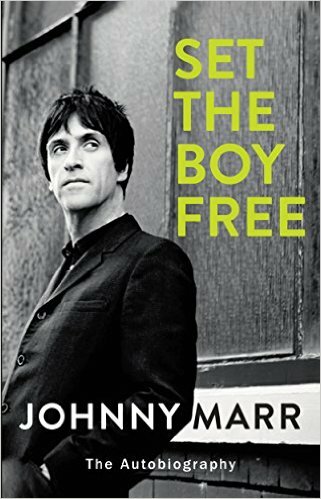 As the sole author of Set the Boy Free, his voice is romantic not rowdy, more cosmic than chaotic ... Marr’s meeting with Morrissey – the biggest selling point of this book – is approached sweetly...He writes with palpable joy about their friendship and music, a mood often ignored in light of the band’s messy split ... But Set the Boy Free is much more than an obituary for a brilliant band. It’s also a love letter to the women in Marr’s life – his wife Angie, whom he met at 15, and musicians such as Kirsty MacColl and Chrissie Hynde. The richest passage of the book describes a long, solo songwriting weekend ... At other times, explanation of the songwriting is absent of any details at all. It can be quite common among musicians to describe songs simply arriving, a crutch Marr also leans on, thought he at least writes of the circumstances under which spontaneous song arrival can occur ... though Marr’s directness is refreshing, his account too often centers on simply telling what happened, lacking true revelations or a deeper insight into why The Smiths connected so deeply and have endured so strongly in the three decades since the band broke up. Still, Marr’s prose is sharpest and most engaging when writing about music. ...[a] breezy, often scattered autobiography ... For every Bruce Springsteen who writes thoughtfully and perceptively about his life, there are a dozen more erstwhile rockers whose books are cheap cash-ins or vanity projects. Unfortunately Set the Boy Free tilts toward the latter, although not without some redeeming qualities ... The book is best when he sticks to musicianly shop-talk ...This odd evasiveness is not confined to all things Morrissey. Much of Marr’s story is shadowed by an elliptical defensiveness. What did you think of Set the Boy Free?